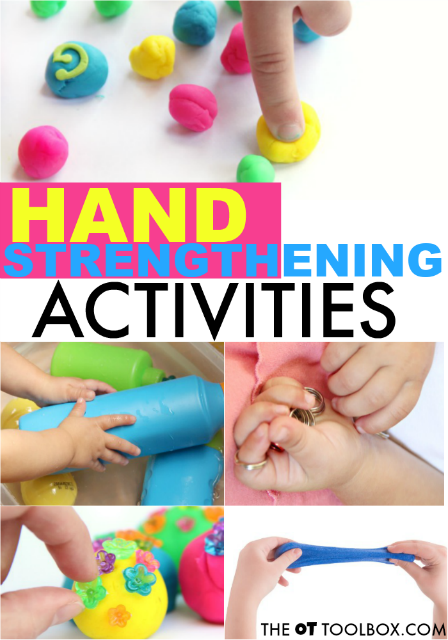 Below, you will find hand strengthening activities for kids, hand strength activities for adults, and therapy tools to develop hand strength. 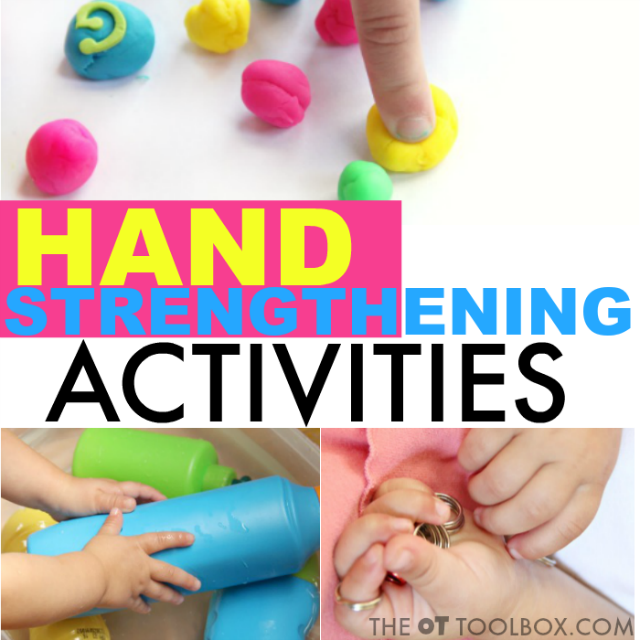 The activities to strengthen fine motor skills included in this post are perfect to improving grip strength, pinch strength, or as part of a finger exercises program for handwriting. Fine Motor Strength is essential for so many reasons! From maintaining a grasp on a pencil to opening and closing scissors, to buttoning buttons, snapping snaps, tying shoes, coloring a picture without stopping, to most everything we do...hand strength matters! Here, you will find a collection of fine motor resources and hand strengthening activities that can be used to improve tone in the hands, increase stability in the thumb and fingers, develop and define arches of the hands, improve precision with in-hand manipulation, improve endurance in hand strength, and address separation of the sides of the hand...in fun and creative ways! So often, we see weak arches, instability, and low tone in the hands that transfers to awkward use of the hands, impractical grasps, and poor endurance in writing or coloring. Sneaking in a few strengthening activities each day can make a world of difference! First, if you receive The OT Toolbox newsletter, you've seen a trend over the past few weeks. I've been loading subscribers up on therapy resources. Each week, you will find a selection of resources on a particular topic that will provide a variety of strategies to address particular therapy areas. Pick and choose the tools you need and add them to YOUR OT Toolbox. Use them to tackle goals, address underlying skill areas, and focus on function in fun and creative ways! Today includes a collection of hand strengthening activities that can be used as hand strength activities for adults, and to develop hand strength. Scroll through the activities below to find creative hand strengthening ideas to improve grip strength, pinch strength, or as part of a finger exercises program for handwriting. First, check out our huge online library of fine motor activities. This is a collection of all of the fine motor activities on The OT Toolbox. There's something for everyone. One thing that makes a big difference in fine motor dexterity is addressing separation of the sides of the hand. This post explains more about motoric separation of the hand and here is another fun activity that really strengthens those muscles. These OT activities using tongs are great for developing and strengthening the arches of the hands for improved intrinsic strength. In fact, the intrinsic muscles are the muscles in the hand that define the arches of the hands, bend the knuckles, and oppose with the thumbs. Activities like this intrinsic muscle strengthening activity can easily be replicated at home or in the therapy room. Among these muscles are a group called the lumbricals. The lumbrical muscles have a job to bend (flex) the MCP joints and extend (straighten) the PIP and DIP joints. When the lumbricals are in action, the hand might look like it is holding a plate with the big knuckles bent and the fingers extended. Read more about strengthening the intrinsics here. When kids write or color with a thumb web space area squashed shut, it's a sign of problems. Then might be compensating for thumb instability, underdeveloped hand arches, and/or poor strength. Each of these problem areas will lead to difficulties with handwriting, dexterity, manipulation of small items like beads, and pencil grasp. Writing with a closed web space is inefficient and will cause poor and slow handwriting, especially as kids grow and are expected to write at faster speeds. A closed web space while attempting to manage fasteners such as buttons and zippers will lead to fumbling and difficulty. So, what do you do if you've got a kiddo who is squashing that web space shut during functional tasks? I've got a few ideas on how to work on open thumb web spaces. Here are even more ideas to promote thumb stability and tone with activities designed to open the thumb web space. Strengthening the hand can occur through a variety of pinch and grip exercises. Here are ideas to strengthen the hands using clothespins. In-hand manipulation is a skill requiring strength in the hands. Activities like this in-hand manipulation activity can boost these skills. ▪ Finger-to-Palm Translation: Movement of an object from the fingers to the palm i.e. picking up a coin and moving it to the palm. Each of the above skills can occur with items "squirreled away in the palm using the pinky finger and ring finger. This is called "with stabilization". If other items are not pocketed away in the palm while in-hand manipulation occurs, it is called "without stabilization". Stabilization typically occurs around 2 years of age. Read more about in-hand manipulation here. Here are a couple of activity ideas that can be easily replicated at home. Finally, I wanted to add a resource product that will help with fine motor strengthening. 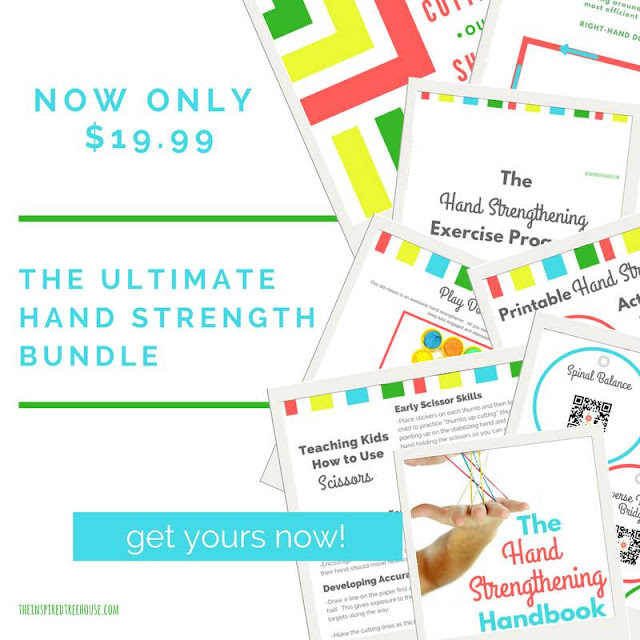 The Ultimate Hand Strengthening Bundle is an exercise program that has everything you need to set up strengthening exercises, print off hand outs, send home home programs, and consistent approaches to building hand strength while ensuring carryover and tracking progress. 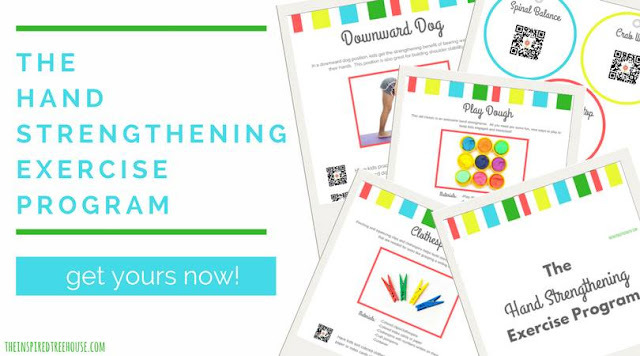 This hand strengthening program was developed by my OT and PT pals over at The Inspired Treehouse. The bundle is on sale only through the 21st and is a deal priced at $19.99. So if you are looking for programs to strengthen the hands, this one would fit your needs. How will you use the hand strengthening activities and ideas listed above? Maybe in a home exercise program or in a therapy program that runs throughout the school year? Maybe you will use the ideas at home or in a clinic. The ideas are endless!